The Californian automation manufacturer Opto 22 has announced a new way to build and deploy simple, scalable operator interfaces based on computers and mobile devices such as smartphones and tablets. 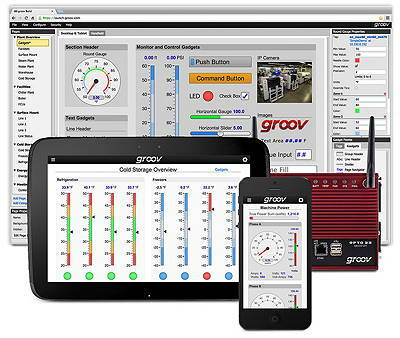 Using only a Web browser, the groov system lets you deploy browser-based operator interfaces for automation, monitoring, and control applications. These interfaces can then be viewed on almost any computer or mobile device, including tablets, smartphones, and even smart televisions. The technology is intended to augment traditional HMIs by making information available anywhere, at any time. It cuts the time, complexity, and costs usually associated with developing mobile HMIs by operating within a Web browser and running on a secure, industrially hardened network appliance called the groov Box. The system needs no programming, or runtime or viewing licenses. It scales to any screen size automatically, allowing the HMIs to be viewed and manipulated from almost any device. Unlike other technologies that depend on additional software such as Flash, Silverlight, or Java, groov needs no additional software or plug-ins. 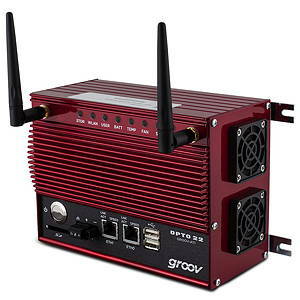 The heart of the system is the groov Box (above), which interfaces with control systems via three independent network interfaces: two 1Gbps Ethernet interfaces; and one 802.11b/g/n wireless interface. All communications between the Web browser and the Box are encrypted. At present, the system connects to Opto 22’s Snap PAC automation systems and OptoEMU energy monitoring products over a separate and segmented wired or wireless Ethernet network, adding a secure barrier. Support for the OPC-UA protocol is planned for later this year and this will allow the system to communicate with equipment from other manufacturers with an OPC-UA server. A simple, flexible development environment, called groov Build, cuts the time needed to build interfaces compared to traditional HMI screen-building tools. It includes a library of scalable, touchscreen-ready gadgets such as gauges, buttons, range indicators, text entry, sliders, and trends. Images and real-time video from network IP cameras can be added. Opto 22 says the apps will be ideal for OEMs and system integrators that use iOS or Android devices as operator interfaces. When used on iOS devices, such iPhones, Ipads and iPod Touchs, the operating system can be configured to limit the user to using only the groov View app. Administrators can disable the device’s hardware buttons, and stop it from sleeping, effectively providing a low-cost, low-power, wireless, touchscreen operator interface locked down for one use only. This facility is expected to appeal to OEM machine-builders wanting to use off-the-shelf iOS devices in industrial enclosures. It will also useful in building control applications, where the mobile device can be mounted on a wall and operate as a combined lighting control, thermostat, and audio/video control. The groov system is available at a suggested list price of $1,995 in the US. The free groov View apps can be downloaded from the Apple App Store and Google Play.